and a few further afield, everthing you need to empty your wallet. I do not include anyone on this list unless I have had a satisfactory personal experience with them. Do yourself a favour and hire an ABYC® certified marine technician. Whatever you need in stainless steel from anchor rollers to radar arches, John can build it as a piece of art. No website. Need your props tuned or repaired, this is where I go. Drew Road, Mississauga. 905-612-8042. OIl analysis , you can buy an oil analysis kit at any UAP or NAPA store or go to the site linked but read this first to see if it's worthwhile. All the stainless nuts, bolts, rivets and fasteners you will ever need at a fraction of the cost at any marine store. Electronics and electrical; by the ABYC® electrician I use. Perkins, Cummins, Velvet Drive, Volvo, ZF transmissions. Just becuase they are in Virginia doesn't mean you can't have your parts in 48hrs. Very knowledgable and amazing service. Ray sells and installs all the bigger ticket items like windlasses, thrusters, a/c, diesel heaters, nav systems and more. Strange name ... but Robert Wainwright is the mechanics I use. 416-406-4348, Toronto Outer Harbour Marina. 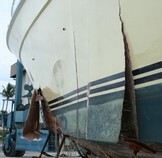 Kim Anderson does master level fiberglass repair and specialty paint work. No website. Custom machine work is sometimes less costly than buying off the shelf. 416-234-8446, 25 Coronet Rd. Etobicoke. Hydraulic steering problems ? These are the guys to see for rebuilding helm pumps or hydraulic rams. 5yrs of brutal abuse and they replaced it free although it was out of warranty. They felt it should have lasted longer..
Every boat engine should be protected with one of these raw water flow detectors get the details here but buy it on Amazon. I installed their hydraulic steering system on my boat. A lot less $$$$ than the others and an excellent product. Custom poly water, waste or fuel tanks and all those odd plastic fittings the plumbing store dosn't carry. Well stocked and staff that goes the extra mile. I modified an Anchorlift windlass to suit my own purposes. They sent the parts I needed from Norway in three days ....no charge ! Air conditioning and heat for your boat ? This system is a little different and makes more sense than the others for northern climes. My personal experience .... No one, absolutely no one has better customer service. No website. Mirek Serdynski 416-903-6153. I have not used the services below but feel they may be worth checking out. These guys will come to your boat and polish (clean) your diesel fuel. Used boat gear consignment shop. Save a few bucks on gear. Mostly sailboat stuff.